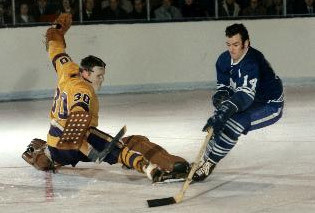 I love the Toronto Maple Leafs hockey club and the reason I am still a fan is because of a yearning to see respectability and glory returned to what was once a proud franchise with a tradition of winning. Conn Smythe would roll over in his grave if he knew what the Buds had become since their last Cup in 1967 (FYI, the Blackhawks have been waiting even longer for a Cup, their last win being 1961 when Mikita and Hull were their big guns!). For me and my father, it's about seeing some dignity and a winning tradition restored to a franchise that he remembers and I dream about. My father and I don't care about profit margins, corporate sponsorship, good branding or any of that crap. Like the real fans we want to see winning, a team that has guts, passion, and a never-say-die attitude rather than the whiny, spoiled, Muskoka Five-type attitude prevalent of late, where you love being a Leaf because of the social perks and treatment by myopic fans who do not care enough about seeing the Cup return to the Leafs. And if it happens in my lifetime, a Cup win for the Leafs will make it all that much sweeter because I will have stuck it out rather than giving up. I hope my dad gets to see it too! * To my friends who are Canucks fans: Your team is by far my favourite team in the league outside of the Leafs; I always sincerely hope for their best and love to see them succeed. However, please stop comparing the Leafs and Canucks based on playoff performance (the most common comparison you bring up): if you examine the stats, the Canucks have really had little better playoff success than the Leafs in the the last 20 years or so, not withstanding the miracle run in 1994. In the last two decades the Leafs have made it to the Conference Finals four times and Vancouver has made it...once, where they beat the Leafs in five games. Yes, in general, the Canuckleheads have had more success in the regular season, but what counts is how you do when you're not playing for a salary anymore. And based on that measure we've shown more stones than you have in the last couple of decades, in my humble opinion. We've missed the playoffs for four straight years now, a fact you never stop reminding me of, but funnily, so did YOU between 1996 and 2000 (not to mention 2005-06 and 2007-08). Have your teams been better than the Leafs in general? Absolutely. Do you have some of the most hot and cold fans in professional sports? Heck, yes. Have you wilted like violets in the playoffs? Yup. Is the Luongo-Sedins axis getting it done for you? Not in a million years and it's not looking likely in the future either, despite Luongo's long-term deal. So, please cut the mockery, because when it comes to playoff performance comparisons, you don't have a leg to stand on. End of rant. Bing Man out. Posted by The Renegade Librarian at 12:08 p.m.
i) did you imply your #2 team is NOT the Avalanche of Colorado? checking. ii) are you implying you and MrsB will probably NOT name your 1st born son anything close to Rich or Peddie? "and we pray this in Burke's name, amen." I wonder who you will be picking for your next Messiah? There's only one hope for complete rescue! And we all know who that is! on another note, What are your thoughts on your vacant Captaincy? you are going to be waiting a LOOOOONG TIME sucka!